Earn 5200 loyalty points when you order this item. 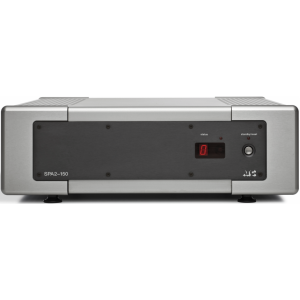 ATC SPA2-150 dual-mono amplifier uses a grounded source output stage to deliver over 200w of power, driven by a buffer based on the discrete gain block used in the highly acclaimed ATC SCA2 preamplifier. ATC have been designing and building Professional Studio electronics for many years earning a sterling reputation for active loudspeaker crossover and associated power amplifiers built into their Active Studio Monitors. As designers of the world's most sophisticated loudspeaker drive units, ATC has a unique and extensive insight into the requirements for a power amplifier to properly drive a real loudspeaker load. The grounded source amplifier with its novel swinging supply best meets those requirements. The discrete gain block drives the FET output stage so distortion components are more than 95db down under any conditions, ensuring totally clean and transparent sound with the effortless dynamics for which ATC is renowned. Input to the amp uses a similar discrete gain block and offers both balanced and unbalanced capability for universal system matching. This input buffer, which completely eliminates integrated circuits, achieves the same levels of transparency as ATC SCA2. The output stage of the ATC SPA2-150 is continuously monitored by micro-computer and a carefully programmed limiter prevents amplifier clip and protects loudspeaker drive units. A front panel indication of limiter operation is provided separately for each channel. Additionally, the amplifier is monitored for over-temperature and DC offset. Construction is Twin-mono, with separate high capacity mains transformers for each channel. The FET output stage is very fast and layouts follow best RF practice with direct signal paths and direct low impedance power supplies. Styling is complementary to the ATC SCA2 with high quality peened stainless steel covers atop naked aluminium machined corners. Remote control of the ATC SPA2-150 is possible using the SCA R remote controller, or any other standard RC5 device. High-quality connectors are used throughout including massive WBT terminals.